Indian actor and singer Joseph Vijay Chandrasekhar, better known as Vijay, is one of the most popular and influential actors in the country, is best known for his works in Tamil Cinema. He is also called by Thalapathy by his fans, earned recognition via his super hit films Poove Unakkaga (1996) and Kadhalukku Mariyadhai (1997). Vijay has a net worth of $64 Million which translates to INR 420 crore at the current exchange rates. Vijay makes most of his money from films and brand endorsements. Vijay was born Joseph Vijay Chandrasekhar on June 22, 1974 in Chennai, India to S. A. Chandrasekhar, a popular Tamil film director and Shoba Chandrasekhar, a reputed playback singer and carnatic vocalist. He grew up in Chennai since childhood and attended Balalok Matriculation Higher Secondary School in Chennai. He dropped out from college to pursue his interest of acting. He had appeared in quite a number of films as child artists who made his debut as the lead hero in Naalaya Theerpu, but the film didn’t do any favor to him. His first commercial hit was Poove Unakkaga which earned him a stardom status. Vijay went on to appears in numerous films in since his break, including Love Today (1997) Nerukku Ner (1997), Kadhalukku Mariyadhai (1997), Kushi (2000), Friends (2001), Ghilli (2004), Nanban (2012), Thuppakki (2012), Kaththi (2014) and Their (2016) among others. He has had acted in 61 movies till date and Mersal is his latest film, which is scheduled to release for Diwali 2017. There is no doubt that Vijay has a huge fan following in Tamil Nadu and its neighboring states, thanks to his charming looks and mind blowing performances. Vijay has emerged as a marketable actor in the span of two decades, who makes around INR 45 crore per year. His current remuneration for a film stands somewhere between INR 30 crore to INR 35 crore. 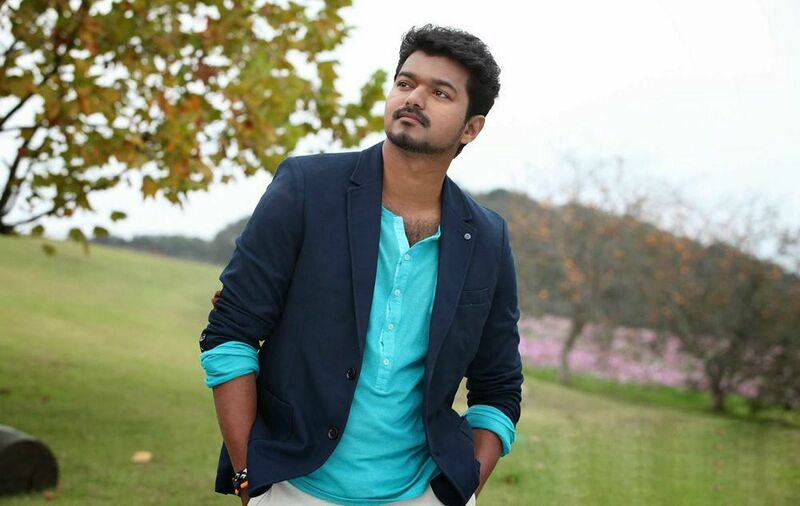 Vijay’s net worth includes income from his films, brand endorsements and personal investments. His wealth has likely saw a growth up to 35% in the last few years. Apart from an actor, Vijay is also a playback singer, who has sung many songs in his movies. He is well acclaimed for his philanthropic works with his social welfare organisation Vijay Makkal Iyakkam started in 2009. Vijay was listed in Frobes India Celebrity 100 list twice for the consecutive years of 2012 and 2013. Vijay has been endorsing several brands including Coca-Cola, Sunfeast, IPL, and Jos Alukkas since 2002. He has received numerous awards during his film career, including 3 Tamil Nadu State Film Awards, 8 Vijay Awards among others. Vijay married a London-based Sri Lankan Tamil, Sangeetha Sornalingam in 1999. They together have two children, a son named Sanjay and a daughter named Divya. Both of them have made cameo appearances in his films. He lives in a posh house in Saligramam, Chennai. Vijay is an avid car collector who has a fleet of expensive cars in his garage including cars from brand like Rolls Royce, Audi, BMWand Mercedes.